It is common knowledge that a few individuals always seem to be more successful than the majority. One angler always catches the most fish; one individual always shoots the biggest deer, elk, moose, or whatever. This person is not just lucky. They are not the one that occasionally catch their limit, shoots the most or the biggest game animal or bird. This is the person that consistently is head and shoulders above the rest of the pack, and consistently produces results when everyone else is drawing a blank. This is the person that you either love to hate, or wish that you could enjoy their degree of success. If you want to join that elite club I can offer the following suggestions that may help you in your pursuit. I have spent most of my life involved in a variety of outdoors activities, and over time I have known many very proficient sportsmen and women. Without exception they all had devoted many hours to honing their skills, and preparing themselves to take advantage of every opportunity. This is what separates the exceptional person from the rest of the pack. At one time I taught classes in fly tying and fly-fishing, and on the side of my portable fly tying box I had the following quote. The author and the source have been lost in time, but the message still rings true. "Nothing in the world can take the place of persistence. Talent will not, for nothing is more common than unsuccessful men with talent. Genius will not. Unrewarded genius is almost a proverb. Education will not. The world is full of educated derelicts. Persistence and determination alone are omnipotent." I have had the great fortune of having rubbed shoulders with some very exceptional men and women hunters and anglers. Without exception they all had a dogged determination and persistence to be successful, however success was something that they had determined for themselves. Few, if any, of the individuals that I would consider outstanding in their individual field of endeavor subscribe to some external measure of success. While determination and persistence are fundamental to success it must be focused and directed in a logical and systematic manner if the desired results are to be achieved. This is where attention to detail becomes paramount. Although I have personally tackled most of the outdoor sports at some time in my life I have expended the greatest amount of time and energy in two diverse fields; fly fishing and ornithology. While widely divergent in their respective goals they are both quite similar when viewed from the aspect of practical application, and I will use these two endeavors to illustrate my point. The competent fly fisher and the competent ornithologist have to apply themselves to a serious regimen of learning. This learning may be in the form of formal education, or in the less formal, but equally effective school of personal observation and application. The most successful individuals that I know have spent time in both of these classrooms. Formal education can come in the form of classroom settings taught by qualified instructors, or by applying oneself to the written documents created by others that have preceded us in our field of interest. In our modern era we are blessed with a wealth of information in the form of books, magazines, audio-visual products, and the latest provider of information, the Internet. One of the biggest challenges facing a person that is just beginning to learn something new is to sort through the plethora of information available, and decide what is relevant and essential. Today we have the benefit not only of the knowledge of our contemporaries, but also those individuals that contributed to our current storehouse of knowledge from previous times. 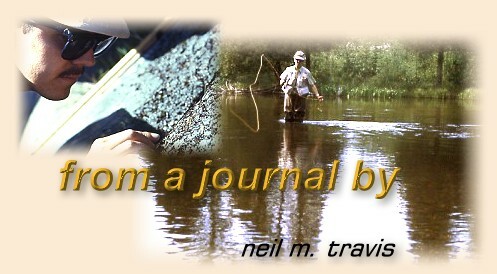 Fly fishers and ornithologists both have a tremendously rich heritage contained in the written word. Essential to both fly fishers and ornithologists is time in the field. One of the unfortunate things that I have observed in recent years is the number of individuals that have extensive book knowledge, but virtually no practical experience. In both fly-fishing and ornithology I have encountered individuals whose formal knowledge of the subject was impressive, but on the trout stream or in the field observing actual birds they were completely inept. Some of the most competent fly fishers and ornithologists that I have had the privilege of knowing possessed a combination of formal learning and practical experience. What separates the best from the rest is a willingness to try. If you are unwilling to fail it is unlikely that you will ever be truly successful. Once the basics have been mastered, whether in fly-casting or bird identification, it is time to put those skills to the test. Fly-casting on a lawn is a great way to master the essential casting strokes and identifying birds with flash cards or pictures has its merit, but fly casting on a trout stream and identifying birds in the bush is an entirely different dimension. Paying attention to the nuances, the subtle details that escape others are one characteristic that separates the elite from the crowd. I knew an old fly fisherman whose proficiency on the trout stream was the stuff of legend. Over a lifetime of careful observation he had discovered certain subtleties involving light and color that enabled him to construct flies that were far more effective than other patterns that were tied to represent the same insect. While thousands of others had observed the same insects they had failed to notice these subtle differences. Not only did he observe something unique he was able to translate it into something that made a very real difference in his ability to catch trout, especially when they were being very selective.